Joseph W. Pfeifer is the Chief of Counterterrorism and Emergency Preparedness for the New York Fire Department (FDNY). During his career he has commanded some of the largest fires and emergencies in New York City’s history: he was the first chief at the World Trade Center attack on the morning of September 11, 2001, played a major command role during Hurricane Sandy in 2012, served as an Incident Commander at the Metro North commuter train Derailment in 2013, and assisted in developing the Ebola response in NYC in 2014. 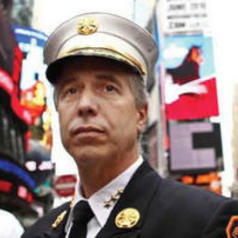 He is the founding director the FDNY’s Center for Terrorism and Disaster Preparedness, which was created after 9/11. Since then, he worked as a strategic leader assessing the Department’s response performance, identified new budget and policy priorities, helped overhaul management practices, created partnerships to supplement the Department’s existing competencies with new expertise, shaped new technologies for emergency response, and developed the FDNY’s first Strategic Plan, Terrorism Preparedness Strategy, and Continuity of Operations Plan. He produces weekly analyses of threats and crisis response throughout the world and is also a Citywide Command Chief, responsible for commanding major incidents. Pfeifer is a Senior Fellow of the Program on Crisis Leadership at Harvard Kennedy School and has presented in several of the program’s Executive Education programs, including Leadership in Crises and China Crisis Management. He is also Senior Fellow at the Combating Terrorism Center at West Point and has spoken about crisis leadership and disaster management at Harvard University, Columbia University, Wharton, the Naval Postgraduate School, the United States Military Academy, the FBI, and Tsinghua University in Beijing, China. He holds a Masters in Public Administration from Harvard University’s Kennedy School, a Masters in Security Studies from the Naval Postgraduate School, and a Masters in Theology from Immaculate Conception. He writes frequently and is published in various books and journals.